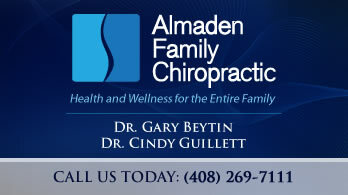 Thank you, from all of us at Almaden Family Chiropractic, for your very gracious referrals. The greatest compliment you can give a Doctor of Chiropractic is to refer a family member, a loved one, or friend to them for care. We thank you for sharing our passion with others. There is no greater gift than the gift of health! Husband and Wife, Dr. Gary Beytin and Dr. Cindy Guillett have been practicing in the same office for over 30 years. Together they have created a welcoming “family” environment that is felt by all. They are dearly proud of their staff, (sisters) Jamie and Joanie. Almaden Family Chiropractic is open extended hours, including Saturdays. We take care of adults and kids of ALL ages, pregnant women, athletes, retirees, stay-at-home moms, workaholics, weekend warriors and everyone in between. We offer massage, several forms of physical therapy such as ultrasound, muscle stimulation, laser, nutritional advice, digital X-ray, the computerized “Pro-Adjustor” technique, exercises, etc. all secondary though, to complete, quality CHIROPRACTIC CARE. Our goal is to restore your body to optimum health in a relaxed, loving environment. Come meet us and let us help you get healthier! Many patients begin care in our office with a specific health concern and then realize that chiropractic is all about optimal health …how to get well faster and stay well longer. They discover wellness care on their own! Sound interesting? Please contact our Almaden chiropractic practice to schedule a no-obligation appointment. I’m already feeling better than when I came in! Convenient location. Open business hours are great. Love the helpfulness of everyone there! Thanks! A really brilliant first experience that instilled both confidence and comfort. Thank you! I am vary pleased and look forward to future adjustments to keep me in good health. The entire feeling in the office is the perfect blend of relaxed and professional! Great experience. I’ve already recommended your office. Thanks for your great service! This was my first ever visit to a chiropractor. In fact, I rarely visit any medical professional. I highly recommend the Almaden Family Chiropractic Center. It is amazing. Appointment scheduling very accommodating, and helpful reminders for appointments were appreciated. I am glad that I came to Almaden family Chiropractic for treatment. So thorough and beneficial. I’m very happy! Dr. Cindy was very nice and thorough. Fabulous! My first visit has already given me some relief. It was truly a wonderful experience! The doctor and all the staff were very friendly and helpful. This was only my first visit but I had immediate relief after the adjustment. Felt very comfortable at all times, very friendly staff, and really feel they will help “fix” me. Wow! I have never been to a chiropractor but I am so glad I chose this office and Dr. Cindy is amazing! She is so thorough and allows questions and listens to concerns. I hit the jackpot! I would absolutely recommend this office for anyone looking for a great chiropractic experience.